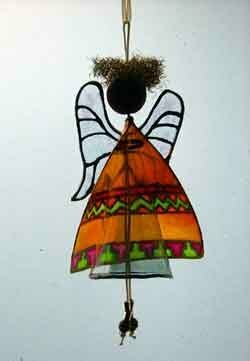 Hang these adorable angels in a window to welcome guests this festive season, or place on top of the Christmas tree. Be creative and play with colours to create an angel to suit your unique Christmas style. Place the acetate over the body, cloak and wings design and use the Dala Glass Liner to trace the design onto the acetate. Leave to dry for 2 – 3 hours. Tip: For an effective, evenly-lined design, ensure that the liner bottle is held at a 45° angle, so that the hole of the nozzle is always visible, thereby creating a raised and not a flat line. Starting against the liner and working towards the center of the design, colour the desired areas with Glass Glaze. Leave to dry for 24 hours. Tip: The Glass Glaze bottle should never be shaken – this will only aerate the paint. Only stir the paint gently when necessary. To ensure a perfectly smooth finish, the Glass Glaze must be used on an absolutely level surface. Dala Clear Glass Glaze can be used to achieve even more see-through shades on the wings – just mix with the colour until the desired shade is achieved. Wings: turn around and use the Dala Glass liner to trace the design on the back of the acetate to create a three dimensional effect. Use the scissors to cut the designs out. Push the kebab stick through the polystyrene ball. Tip: This ensures easy handling while painting and makes a hole for assembling the angel at a later stage. Paint the angel’s face – we used Dala Craft Paint Flesh to cover the whole ball, red for the cheeks and black for the eyes. Leave to dry for 2 – 3 hours. Take the body and use the epoxy glue to make a cone. Tip: Laundry pegs can be used to keep the edges together until dry. Take a piece of string (approximately 60 cm), fold double and make a knot 10 cm from the loop where the string is tied double. Push the string through the cone so that the two loose ends can act as legs with the body “resting” on the knot. Press the 10 cm loop at the top of body through the head (if the hole is not big enough, make it bigger with the kebab stick) and make a knot. Place a bead at the end of each piece of string (legs) to be the feet. Make a knot to keep the bead in place. Take the cloak, and with the liner to the outside, using the epoxy glue, glue to the body to the back of the angel at the neck area, using a laundry peg to keep in position until dry. Use some epoxy glue to attach the wings to the center of the cloak. Leave to dry. Lastly, the hair. Take some of the goldilocks strands from the goldilocks pot cleaners and use the epoxy glue to attach to the head. This item has 724 views.